How fortunate we are, cinephiles, to experience the works of Terrence Malick–auteur, philosopher, and man of mystery. After writing/directing Badlands and Days of Heaven in the 70’s, he vanished from the world of film for 20 years. Since 1998, he has completed The Thin Red Line, The New World, and The Tree of Life, and is already finishing two more highly-anticipated films that will appear in the next two years. Malick is also famously camera-shy, giving no interviews, allowing no photographs, and refusing to comment on his work. What we do know about him is that he is from Texas, he studied philosophy at Harvard and then Oxford as a Rhodes Scholar, and translated a minor work of Heidegger as part of his thesis. I will discuss (rather: speculate on) this in greater detail momentarily. Each of his movies is seemingly more profound and beautifully photographed than the last, with the only cause for debate being in what order to rank the movies. I will present my personal rankings, as well as some quick thoughts about each movie. There are several reasons I love this movie. 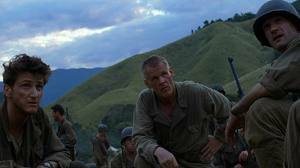 It is Malick’s only war movie, and represents his triumphant return to cinema after two decades. The cast is stacked with big name actors, a fact which only Malick himself was unimpressed with. There is reportedly something like 20 hours of footage for this movie, which was edited down to 3 (there is an online petition for the release of Malick’s first 6-hour cut that was rejected by the studio). Apparently, within that footage lie entire undeveloped stories that did not make it into the final cut. Adrien Brody (not exactly the biggest star in 1998, or even today) only agreed to do the film because he thought he was one of the main characters, CPL Fife; he only had about 10 minutes of screentime and three lines of dialogue in the final cut. Malick also did not hesitate to leave entirely on the cutting-room floor the presence of such typically-headlining actors as Gary Oldman, Martin Sheen, Viggo Mortensen, Mickey Rourke, and Bill Pullman. George Clooney made a two-minute appearance in the final minutes of the movie. Detractors of the film will show their disdain by saying things like “the grass was the main character.” TTRL also had the dubious distinction of being the second big-budget WWII film in the same year, and competing for the same Oscars. Spielberg’s Saving Private Ryan was almost universally recognized as the better movie, and took home all the awards. I think there is no doubt that SPR is a good war movie, with good performances, and which elicits an emotional connection from multiple generations of audiences– Spielberg’s specialty. But TTRL is more profound, and more truthful, by a couple orders of magnitude. It is gorgeously filmed, Malick’s specialty, though perhaps it is not his absolute best work in this area. The Hans Zimmer soundtrack is good, but the best songs are the joyful patois chantings of the local Melanesian villagers. The dialogue is somewhat sparse, interlaid with interior monologue of the characters’ true thoughts (again, a Malick trademark). The film opens with beautiful images of life on a utopian Pacific island. The inner monologue, from Jim Caviezel’s PVT Witt, the film’s ostensible protagonist, informs us about the themes of the film: war (in nature and in man) and death (in war, but representing all life). What’s this war in the heart of nature? Why does nature vie with itself? The land contend with the sea? Is there an avenging power in nature? Not one power, but two? I remember my mother when she was dying. Looked all shrunk up and gray. I asked her is she was afraid. She just shook her head. I was afraid to touch the death I seen in her. I heard people talk about immortality, but I ain’t seen it. I wondered how it’d be when I died. What it’d be like to know that this breath now was the last one you was ever gonna draw. I just hope I can meet it the same way she did. With the same…calm. ‘Cos that’s where it’s hidden– the immortality I hadn’t seen. Where is it that we were together? Who were you that I lived with? Walked with? The brother. The friend. Darkness from light. Strife from love. Are they the workings of one mind? The features of the same face? O my soul, let me be in you now. Look out through my eyes. Look out at the things you made. All things shining. This is quite an achievement for a directorial debut. Martin Sheen’s Kit Carruthers, a dispassionate killer, is perhaps his best career performance. The film suspends any and all moral judgment of the incomprehensible murders, and makes the murderer a refreshingly sympathetic character. The bubble-gum-pop sound of the interior monologue by Sissy Spacek only adds to this mood, as does the addictive soundtrack highlighted by Carl Orff’s music-class, zylophone-driven ‘Gassenhauer’. The exact mood, monologue, and song (slightly modified by Hans Zimmer) was copied in tribute in Tony Scott’s (and Tarantino’s) True Romance. The entire film oozes simple perfection, and should be enjoyed without any reductive or over-thinking discussion. While this qualified as a rare cinema experience for me (I only watch about one movie per year in the cinema), it is almost too soon for me to comment on it. I claim to have no certain understanding of much of it, and plan on a second viewing in the near future. I do know that this is, to date, the most autobiographical Malick piece, and one which he was writing and planning for several decades. The younger brother who mysteriously dies is clearly based on Malick’s own younger brother. It seems that the brother was a classical guitarist who went to Spain to study under the great Segovia, fell into desperation over his musical abilities, and broke his own hands. He killed himself sometime later, and the older Malick maintains a sense of guilt and questioning that manifests itself in TToL. Sean Penn’s character (though the actor himself has stated his confusion over his meaning) inhabits a modern world of unnatural buildings, and is overwhelmed by a sense of nostalgia for an idyllic youth in 1950’s Texas suburbia. The photography is exquisite, and the long sequences of the birth and early life of the universe, derided by some critics, is actually one of my favorite aspects of the movie. Malick shows, once again, no lack of fortitude in making his own artistic vision however he wants, and the result is sublime, to be digested slowly, perhaps over a lifetime. I liked Colin Farrell’s John Smith. I think his haunting and taciturn portrayal is much better than he gets credit for. The visual images in this film are possibly the best of Malick, and it makes me long for some non-existent pre-European New World, free of disease, conflict, and death. It is like the Pacific island of TTRL, both before and after the European settlers (and American soldiers) invade. The opening sequence with the forest primeval and the growing waters of the Rhine, rendered by Richard Wagner’s Vorspiel of Das Rheingold, is moving. Overall, the film strangely feels too long, a rare trait for Malick’s work. It seems like he was trying to be too conventional, or please somebody in a studio, and lost some of the Malick magic. What remains is still better than the best possible work of lesser directors. Visually beautiful, called his masterpiece by some, but not my favorite. The soundtrack by Ennio Morricone also did not impress me (though there are some who will think I’m crazy for such heresy). Since I don’t know what else to say about it, I will relate an anecdote about why Morricone is overrated. Two weeks ago in Vicenza, there was a big celebration planned by the city for the completion of the restoration of the Palladian Basilica in the central piazza. It is a monumental piece of architecture, and for four years it has been surrounded by scaffolding (and on its backside it is still being restored, though no one seems to care about this annoying detail). The party included a concert given by maestro Morricone on Sunday night. The maestro requested that all the shops in the city center be closed the entire weekend so that: 1) his rehearsals could proceed without disturbance on Saturday, and 2) so that no one will be distracted by such things as buying shoes and ice cream in Italy on the same weekend of a free concert by Morricone.